My mistake, it is obvious I missunderstood this. Thanks. It is not urgent right now anymore, but I will keep this info for future troubles, as 10 is very prone to mark the dirty bit on HD. Also thanks for the info for Ram booting through grub4dos a WIMBOOT Install of Win10x64 in VHD in your previous post, it is in fact a little tricky, I'm glad you found the way to make it work. Booting from RAMDISK with Win10x64 in WIMBOOT VHD was a funny experiment. 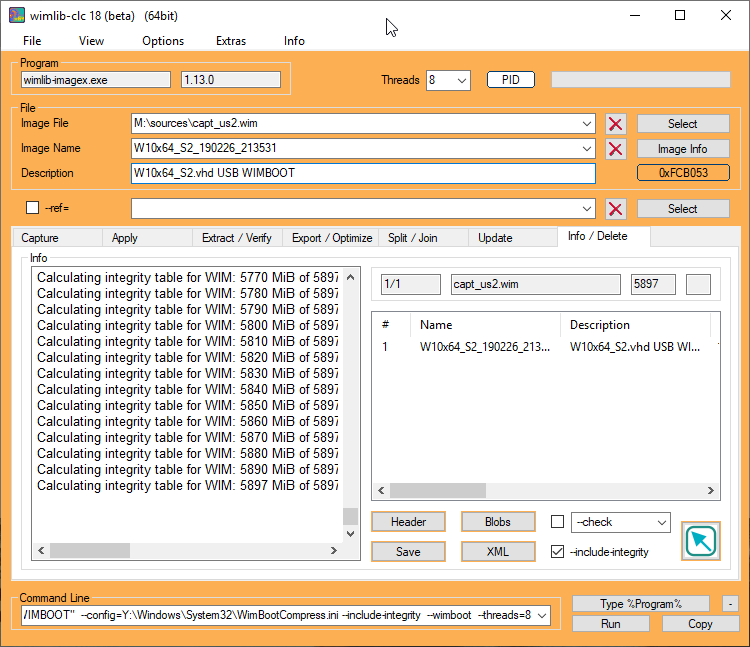 It is a single WIM file that can be located everywhere, whereas the Win10x64 WIMBOOT VHD solution has 2 files and is not portable. 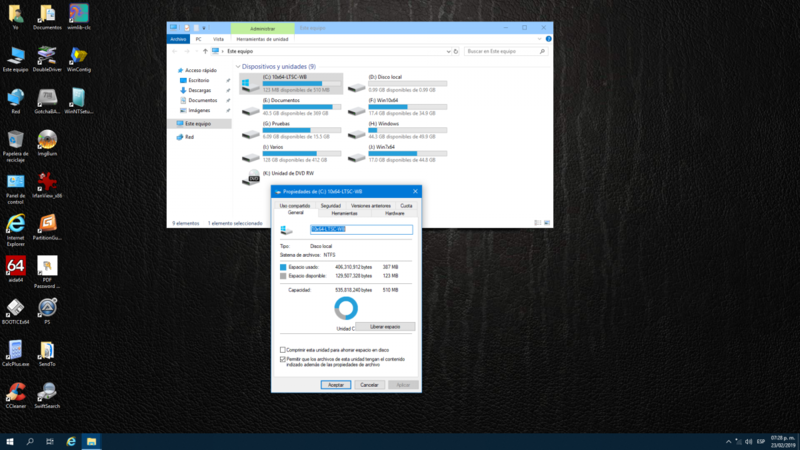 Win10XPE includes AOMEI Partition Assistant and Macrium Reflect to make Backup Image. 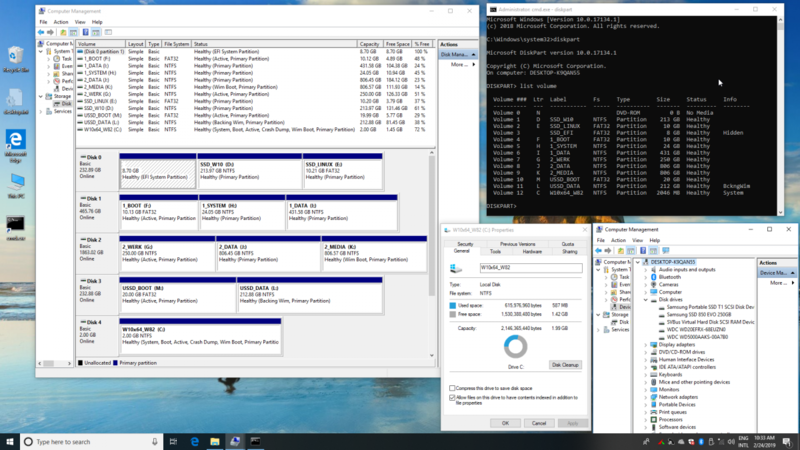 Win10 x64 installed in 25 GB VHDX by WinNTSetup is the most interesting solution and allows booting as FILEDISK. Such VHDX allows you to install any program and to use printers and it boots from Portable SSD very fast on any hardware in BIOS and UEFI Secure mode. It is a universal learning system that contains far more drivers than Win 8.1 and in case of 10 x64 booting from USB and USB 3.0 is supported out of the box. Booting from RAMDISK with Win10x64 in WIMBOOT VHD was a funny experiment, but it has no practical value for me. Yes, you are right, a good WinPE is always smaller and boots faster, I'm totally agree and it's my prefered option, but this do not decrease in any way the merit of your experiment to RamBoot a 10x64 VHD wimboot mode install, AFAIK nobody has done it before, my friend. 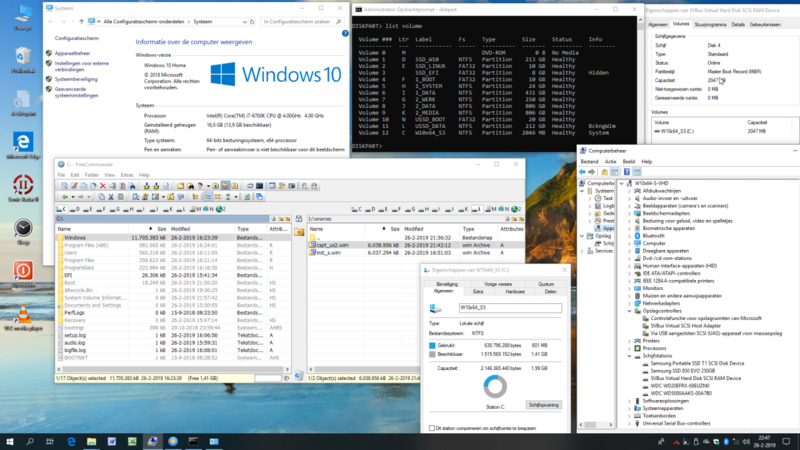 I have since about 6 months ago two Win10 VHDs (a 1709 x64 and a 1809 x86 [this is LTSC 2019 on 6.5 GB, full install, + FireFox, 1.5 GB free]), working very fine, (updates blocked, this may be the reason). Also have available a 120 GB SSD that I may use for this, just need to buy a new disk case for it. As always it is a pleasure to talk with you. 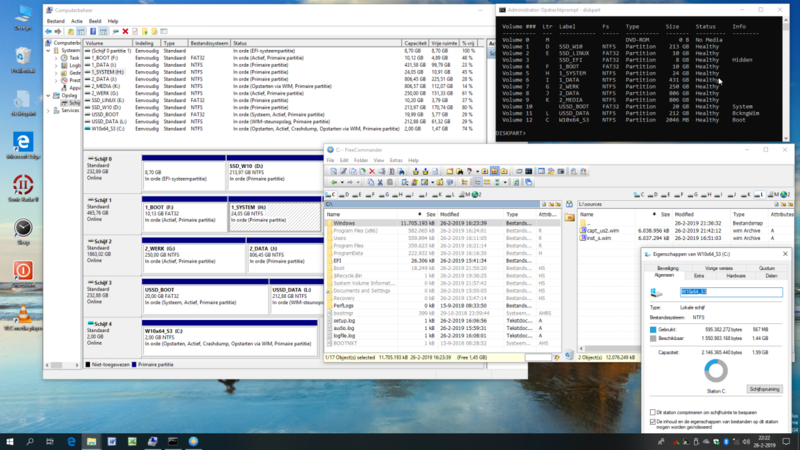 After making a new 10x64 1809 full install, (of course no AV, no pagefile and no swap file) on a 10 GB VHD (not compressed) located on a partition of my MBR HDD, latter installing 7z, Classic Shell, CCleaner and puting several Portables on documents folder, still has 2.49 GB free. EDIT: Forgot to say it is also installed Word and Excell from Office 2003 + compatibility package to read/write Office 2007 and following formats. Then I made a wimboot capture (10x64-WB.wim file is 3.95 GB) and a new wimboot install on a 1 GB VHD (located on internal HDD) having 662 MB free yet, so OS and format is consuming only 362 MB, this is after booting from it. All done upto now using only wimlib-clc and BootIce for editing BCD. So far only Windows boot manager is used, not tested RamBoot yet. I think now run a 1 GB (or maybe 512 MB) 10x64 VHD on RAM looks a little more attractive. 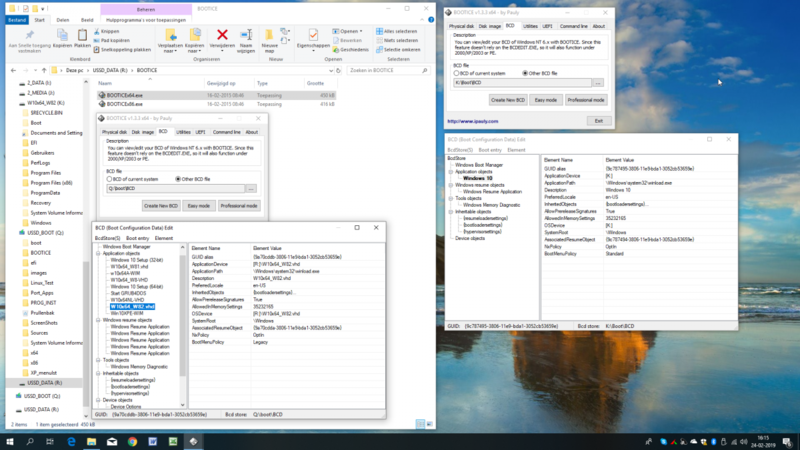 Win10XPE_x64.ISO is 742 MB. Now I need to move the wimboot VHD and the source 10x64-WB.wim file to an external device, I could use a 120 GB SSD as wimb suggested, but I would prefer something more compact as a High Speed U1 SD or MicroSD card on a USB 3.0 adapter as I'm using for my UEFI MULTI up to now. 387 MB used and 123 MB Free, from 510 MB available. See attached picture. By the way on previous post forgot to say it is also installed Word and Excell from Office 2003 + compatibility package to read/write Office 2007 and following formats. And it has also the best and FREE tools to capture/deploy *.wim files (usefull for make/recover backups too), as wimlib-clc and WinNTSetup. Next will be to put this 512 MB VHD on a portable device and see how it boots. Wimb procedure to make it Ram Bootable is a little tricky, I will try to follow it after booting normally with Windows bootmanager from a portable USB device. It will be interesting if you can make it portable e.g. booting from RAMDISK and as FILEDISK from such small WIMBOOT VHD + WIM file located on portable SSD. Did you do any special things besides the things I know and do already to get this impressive size reduction ? I'm starting a new thread for this topic, I wouldn't like to keep hijacking your thread anymore, and now also think the subject deserves its own thead to keep all info together and let other people find it easier, hope you can visit it to see the little details if you want deeper info, and also to help me with RamBooting, as I am specting some troubles with it. So far the new thread is under costruction, it will be ready very soon. 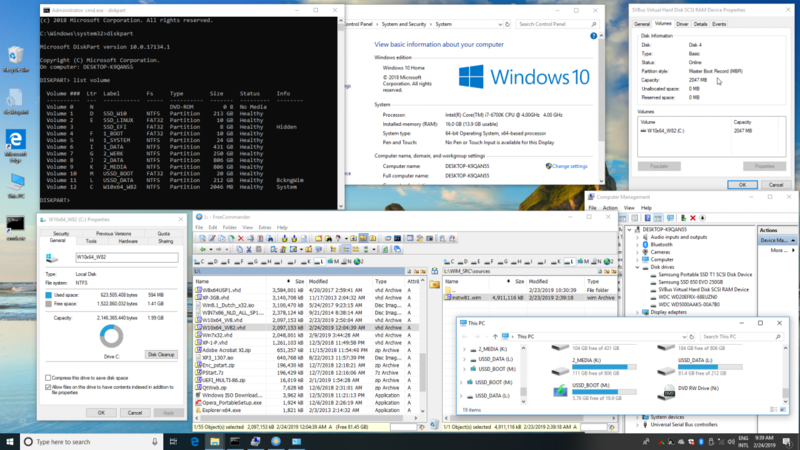 By now I have USB booted from the VHD and source .wim located both (to be totally portable) on same secondary NTFS partition of a USB 2.0 device, (AData UV100 32 GB), it feels as slow like old times booting my first BartPE from a CD, it took about a minute or maybe a minute and a half to get desktop, once there and after waiting about 20 seconds the task manager showed no more disk activity and all was a little slow but fine. This USB 2.0 device is about 24 to 25 MB/sec in reading and writting speed, wich is not bad for a USB 2.0, My MicroSD Kingston with an USB 3.0 adapter is capable of upto real 74 to 75 MB/seg reading speed but only about 14 to 15 MB/seg writing speed, this are real speeds I have observed during real files transfer on daily tasks. Of course once RamBoted all will be very fast, By now my system is consuming about 800 MB, but will check carefully. 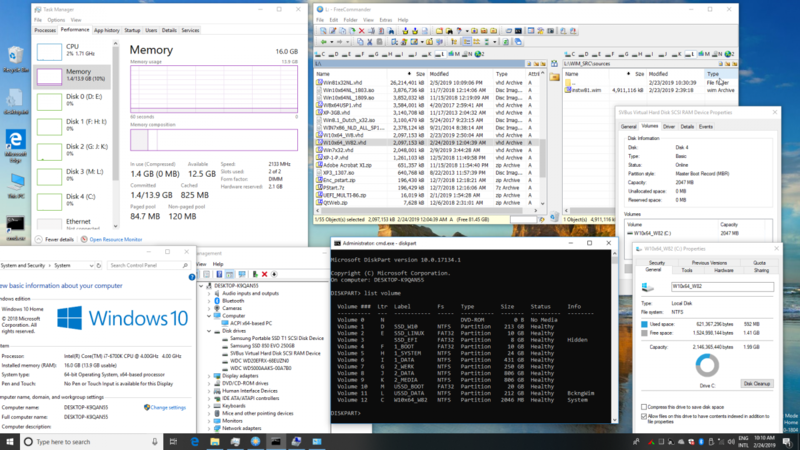 Have you seen how much Ram is consumed when you RamBoot your wimboot VHD?, I'm on an old I3 with 8 GB RAM, hope this can be enought, but would like to make sure. 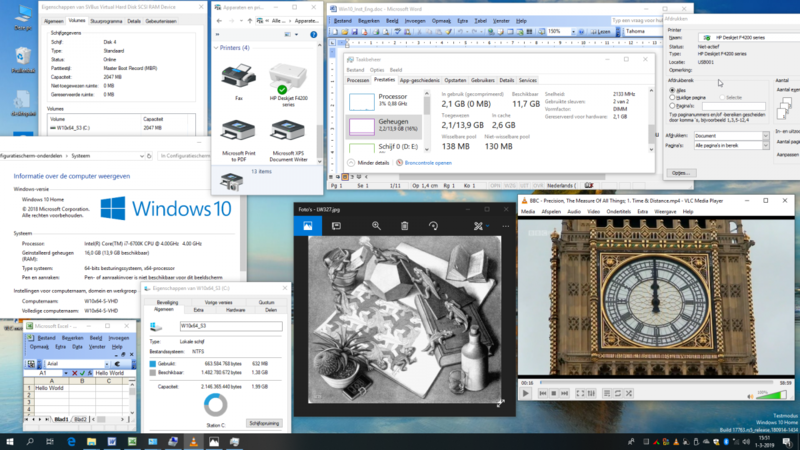 EDIT: This time I made the VHD on my MicroSDHC 32GB UHS-I Kingston SDCS/32GB CL10, 80R (Canvas Select) connected with my USB 3.0 adapter to a USB 2.0 port and it took only 48 seconds to reach desktop, and all was working very fine OS do not feel slow. But I would reccomend you to better buy the new Kingston model Canvas Go! with 90 MB/sec on reading speed and 45 MB/sec on writing speed. I have succeeded in making it portable. 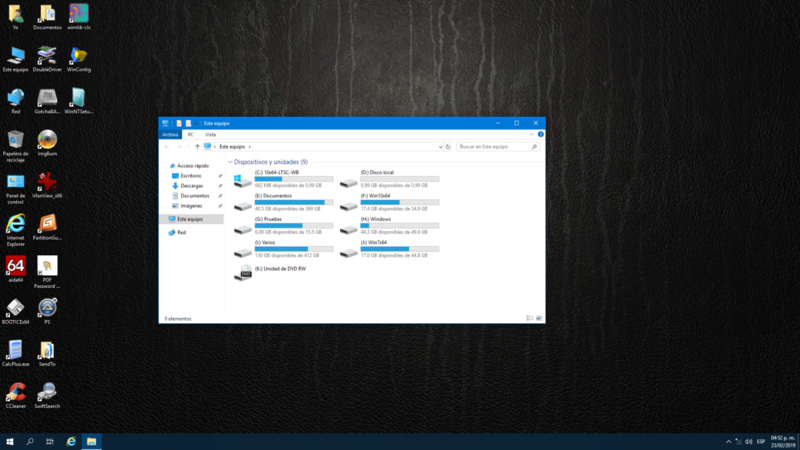 What will be a better menu.lst entry so that the VHD in RAMDISK is always mounted as the real Windows disk number of the Backing WIM file ? this does NOT work, but I will try to find a solution. This could have been a nightmare for all people having more than one internal disk as myself if you haven't found it. And what are your BCD(s) entries into Boot\BCD and the other on efi\microsoft\boot\BCD?, Could you post a picture of one of them opened in easy mode from BootIce please? I assume after installing the SVBus driver as it is unsigned we need to use Test Mode and No integrity checks. But since you have allready booted it, it is easier to ask. I want to avoid me troubles as much as possible. Thanks in advance. You need in BOOTICE to Add New entry AllowPrereleaseSignatures "Yes"
What i do is making more entries. So not only hd3 but also hd0 up to let say hd5. When an entry does not work you will get back to the screen where you can choose again in seconds. just try untill you get the one that works for your PC and harddisk setup. I know not ideal but at least it works fast. I am not sure to understand the problem. If the .vhd is on the same (physical) hard disk (or hard disk like device) can't one parse the output of the root command? The point is that after booting from RAMDISK then Windows has to find the Backing WIM file. corresponding to the disknumber that Windows will give the USB device where the WIM Backing file is located. In all other case e.g. mounting as hd0 then after loading into RAMDISK then booting fails with Error 225 which means file not found. In Grub4dos I can determine the root where my VHD is located with your proposal. So for my configuration I have it working. But when I will try to boot from RAMDISK on machine with two harddisks then I have to use hd2 instead of hd3. You can of course have several menu.lst entries, but using them will then quite often result in Error 225 after loading the RAMDISK followed by boot failure needing Reset. Yep , and IF the .vhd is on (hd3) the proposed snippet will work just fine. Of course feel free to make any needed changes/variations. Thanks Wonko for your proposed menu.lst entry. It does not work as published but it will be helpful for me to parse grub4dos output and to set values in the entry. When I do just the grub4dos command find then I get the list of hardisks and partitions. What I need to do is to parse the output and to get the hd number of the last entry. I don't understand why the posted example wouldn't work. on your system (the SAME one where the hardcoded (hd3) and (hd3,0) work). WHAT is the ACTUAL info you want to get? That works very good . Also good for external USB devices with one or two (MBR/legacy) partitions, and also helps to tests if grub4dos can access or not a secondary NTFS partition on your actual device, a problem I had, as grub4dos can't acces files on secondary NTFS partition of my MicroSDHC 32GB UHS-I Kingston SDCS/32GB CL10, 80R (Canvas Select) connected with my USB 3.0 adapter , some internal driver used into the MicroSD or the adapter is not fully compatable with the very last version (2018.12.22) of grub4dos, tried other versions but same thing. I can run the VHD with Windows bootmanager from second partition, of course not as Ramboot so secondary partition is seen on Windows, but nothing from second NTFS partition can be booted with grub4dos, I was forced to make a second MicroSD with a single NTFS primary partition (it was good I had 3 of them available) in order to be able to Ramboot this VHD (it takes a minute and 48 seconds to load 1 GB in Ram and reach desktop, and it was pluged to a USB 2.0 port on PC [my mistake]). I can reduce the size of VHD to 512 MB and it will be loaded in half time + the time to reach desktop. But to me it doesn't seems excesive as it is now. Of course there are many factors involved here, the USB device reading speed, the CPU speed and Ram speed, so every case will be unique. But from another device, an Adata UV100 USB 2.0 stick with 2 partitions (only empty stick avilable at the time) I have no problem to Ramboot the VHD and it works flawlessly once loaded on Ram but of course it takes longer to load in Ram, just wanted to confirm on other devices can work fine. EDIT: Fixed some typing mistakes (thanks to wimb for find them), please excuse me but it was about 4:00 am in my country when I made the lines this way first time for my menu.lst, and as they worked fine (even with mistakes), just copy paste here and never reviewed them again. Thanks alacran, that is a good idea to use iftitle and avoid find in menu.lst entries. In VHD WIMBOOT we have a two file Operating System, where first grub4dos loads the VHD into RAM. When booting from RAMDISK as WIMBOOT, then Windows has to find the location of the Backing WIM file. but Windows will give the same USB disk the highest disk number. This highest disk number strongly depends on the number of internal harddisks and varies from one computer to another. In this way we have a portable reliable full Win10x64 Operating System on USB booting very fast from RAMDISK and that it will not change e.g. by malware. 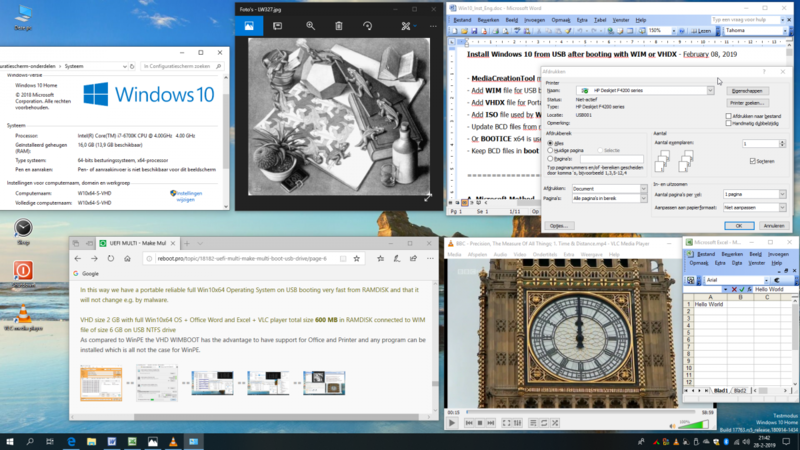 As compared to WinPE the VHD WIMBOOT has the advantage to have support for Office and Printer and any program can be installed which is all not the case for WinPE. Good, well done, you are the man who Rambooted the first time a full wimboot Windows 10 OS, (and I think I'm the second, HA, HA, HA). There is something I want to comment to you, take a carefull look at your second picture on your last post, your VHD first sector is 64. I know this does not seems very relevant but it increase the wear on Solid State devices. 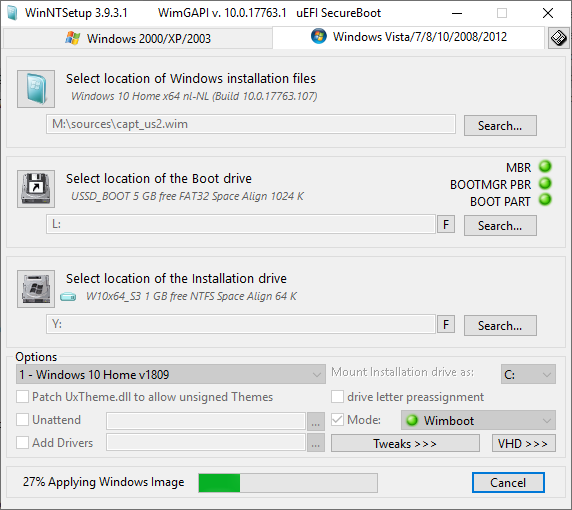 You can use any good partition tool as PartitionGuru Free edition to partition your disk as required, also BootIce can do it but I allways prefer to do it with PartitionGuru as BootIce and Windows 7, 8.x, (haven't tested 10) when making small partitions on VHDs located on USB sticks have the tendency to do not use 2048 as first sector as usually done by OS, they sometimes use 63 or 128 and PartitionGuru allways uses 2048 (but can be changed if required) as starting LBA and automatically make the first partition MBR 6.x and activate it, also installs bootmanager PBR on it and on second partition too. Probably I can adjust settings in WinNTSetup to Create VHD with other value of partition first sector. I was not aware of the possible wear problem for SSD, so I have to study on that subject. Let's debunk these myths at their very start. The "new paradigm" (re:offset of partitions) is (as often happens with anything MS originated) more myths than anything else. The idea of using (as opposed to the head boundary) the 2048 sector for first partition is entirely arbitrary. What was initially a way to have faster access to rotational disks (with - believe me - very little actual gain in terms of speed and only noticeable with database use) became senselessly standard. BUT when it came to SSD's (or more generally flash based devices) it started to make a lot of sense. The first (obvious) advantage (at file system level) is that clusters (usually on NTFS 8 sectors or 4096 bytes) become inherently aligned. The second one (specific for flash and solid state devices) is that the page size (which is the actual unit at which some operations are performed on SSD) is also aligned. The first one is reached with *any* multiple of 8 sectors, though usually powers are used (for slightly different reasons) with an offset of 8, 16, 32, 64, 128, 256, 512, 1024 or 2048 sectors BUT the specific SSD (or flash device) may have a internal "structures", let's call them "page size" and "erase block size" which may (or may not) provide a further slight enhancement, among them, the "page size" is actually be a good idea (while aligning to the "erase block size" makes little sense). These values are (usually but not always) respectively 16 sectors (or 8 kb) and 4096 sectors (256*page size).